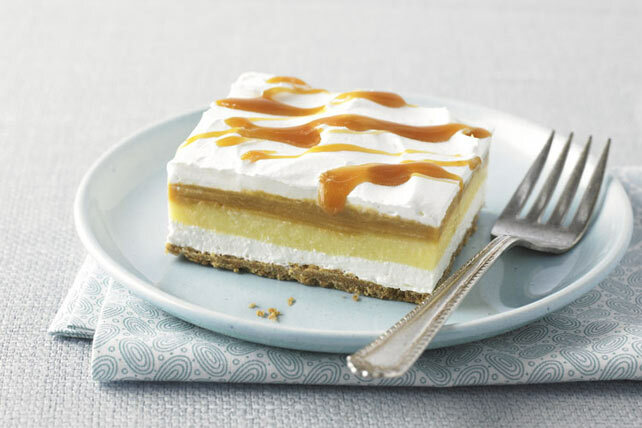 Two favorite flavors come together in this no-bake dessert - a vanilla and butterscotch filling over a buttery graham crumb crust. Mix graham crumbs and butter; press onto bottom of 13x9-inch dish. Refrigerate while preparing filling. Beat cream cheese, sugar and 1/4 cup milk in large bowl with mixer until blended. Gently stir in 1 cup COOL WHIP. Spread over crust. Beat each flavor pudding mix with 1-1/2 cups of the remaining milk in separate bowl with whisk 2 min. Pour in layers over cream cheese filling; top with remaining COOL WHIP. Refrigerate 4 hours. Drizzle with caramel topping just before serving. Save 60 calories per serving by preparing with PHILADELPHIA Neufchatel Cheese, fat-free milk, COOL WHIP LITE Whipped Topping and JELL-O Sugar Free Fat Free Instant Puddings. Substitute JELL-O Chocolate Flavor Instant Pudding for the butterscotch pudding, and chocolate syrup for the caramel topping.